All Porsches are special, but some – like this one – take special to a whole new level. This car once belonged to Ferry Porsche, who has a reputation, shared with other members of the Porsche family, for customising each of his vehicles with extra details that had not yet been rolled out in series production, or that were simply not available on standard models. This Porsche 911 S in an olive green metallic finish is one such car. Although the number plates are replicas, everything else on the car is original. We do not know why Ferry Porsche selected the number plate S-M 2000 for his Porsche 911 S when he registered it on July 30, 1969. Perhaps he thought the number 2000 sounded futuristic; after all, that would fit with the car. The chassis number – 911 0300014 – indicates that this was the fourteenth car with the new 911-S engine, built before the factory shut down for the summer holidays. Customers would only be able to experience the new 2.2 litre 180 hp flat engine after the summer. Porsche had reserved the cars with chassis numbers 01 to 03 for the race team, who intended to use them at the Acropolis Rally, and number 13 was skipped for superstitious reasons. All of this means that this car is one of the first ten Porsche 911 S 180 hp cars to be built for the road, and is probably one of the oldest Porsche 911 S cars still in existence with a 2.2 litre engine. This fact alone makes this Porsche an interesting historical artefact, but its first owner, Ferry Porsche, added a number of unique details to the 911 S. Externally, the 911 S is missing the overriders on its front bumper; Ferry Porsche thought they detracted from the sporty look, although it’s unclear how that fits with a registered, ex works tow bar. Luckily, no such tow attachment is installed. A closer look reveals the aluminium rear lid, which is unusual in combination with the air-conditioning system beneath it. 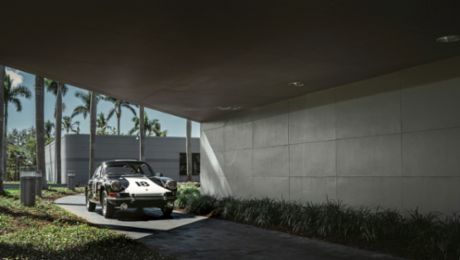 The engine itself is also full of surprises; the injection system uses components that actually belong to the Carrera 6, although it is not clear whether these components were in fact added later. The interior of the vehicle is inarguably 100 per cent original. The ergonomically shaped front seats are covered in material, while the sides are clad in aniline leather – an exceptionally hard-wearing artificial leather that, at the time, was used primarily on upholstered furniture. In the car, it looks thick, strong and smooth. At the time of production, these kinds of materials were very expensive, although the investment paid off, as the interior still looks like new today. The aniline leather shows no signs of age, and the electric power windows, sliding roof and Blaupunkt radio all work like new. This 911 has clearly enjoyed a charmed life. Porsche sold the car on December 6, 1971 to Guy Jean Dubois, a fish merchant from Strasbourg, with 21,113 kilometres on the clock. Dubois’ son worked as an engineer at the company, and he put his father in touch with Ferry Porsche, who later sold him the car. 33 years down the line, the 911 S was still owned by the family; the car was enjoying a life in the sun at the family’s second home in Sainte-Maxime in the bay of Saint-Tropez. In 2004, the car was officially put up for sale, and quickly found a new owner. But this brief moment in the spotlight was enough to bring it to the attention of collector Michael Heinemann. Heinemann had long been aware of the existence of the car, but had not been able to determine its whereabouts. After tracking down this unique 911, he asked a friend from France to write a letter to win over the new owner, the start of a negotiation process that eventually took around a year. The pair finally met in Biarritz in 2009. In 2013, Michael showcased the car at Pebble Beach and continues to maintain it to this day. Driving this car is a special experience. Everything feels so new and untouched. The high quality of this zero-series car is evident in every detail of the design, and the sound of the 2.2 litre flat engine is captivating. It’s good to know that it’s still around, along with a few other of the most special Porsches. Maybe there are even enough for a small series – who knows. Text first published in the magazine "Porsche Klassik 11". The 908/03 distils all of the Zuffenhausen factory’s cornering expertise in a single racing car.